Where should you put your house? First and foremost, martins are looking for safety and security. Raise the house to the full extent of your pole (typically 10-15 feet) and keep the house at least 40 feet away from trees. Martins actually want to be near to you! A location between 40 - 120 ft from your own house works well, as does the center of an open spot or the edge of a pond or lake. Use Decoys and CD’s/tapes – they work! Martins are social and visual and audile decoys create the appearance of site activity, like cars in the parking lot of a good restaurant. If at first you don’t see martins, don’t despair. The migration lasts through the end of June! Be diligent, and keep your house maintained. Also, keep your house up through August. While this is too late to attract nesting pairs, this year’s fledglings will already be scouting for next season. 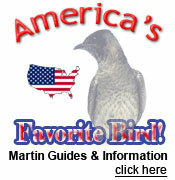 See Birdman Mel talk about attracting Purple Martins to your back yard!